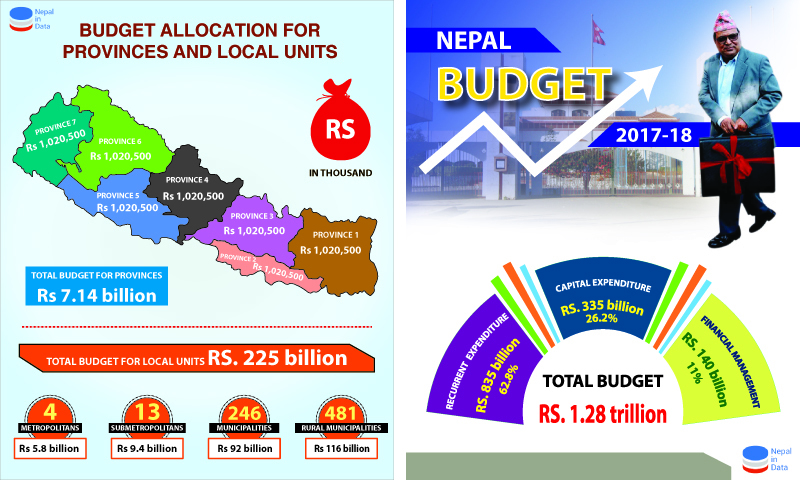 KATHMANDU, May 29: The government has tabled a budget of Rs 1.278 trillion for the Fiscal Year 2017/18, and this budget is different from past ones as it has allocated sizable resources to the federal units for the first time. As part of implementation of the new constitution, the central government has allotted Rs 225 billion to 744 local units and another Rs 1.02 billion for each of the seven provinces. Reading out in parliament the government’s annual income and expenditure plan for the new fiscal year, Finance Minister Krishna Bahadur Mahara said that lawmakers will no longer find the development programs of their localities in the central level budget and programs. “Such programs will be with the rural municipalities, municipalities, and sub metropolitan and metropolistan cities,” added Mahara. Local bodies hereafter will prepare their budgetary programs on their own, changing the existing practice of seeking even small projects of less than a million rupees from the center. Mahara said that the budget has been allocated based on population, development indicators and the input costs of development like price of construction materials and labor charges . As part of financial equalization, each rural municipality gets a minimum of Rs 100 million and the maximum amount is up to Rs 390 million. The range of budget allocation for municipalities and sub metropolitan cities is Rs 150 to Rs 460 million and Rs 400 to Rs 630 million. The local units have also received separate budget allocations as conditional grants, totalling Rs 76 billion. Former finance minister Bharat Mohan Adhikari said that the budget has empowered local units with the implementation of the constitution but the amounts allocated for the local units is not sufficient. “The newly formed local units have to construct their office buildings and institute the new setups,” added Adhikari. The budget is up by 36 percent compared to the revised budget of the current fiscal year. The targetted 26 percent revenue growth (Rs 730 billion) is also one of the highest since 2008. The government aims to borrow Rs 145 billion from the local market but experts say this will reduce the investment the private sector relies on for growth. “The target of meeting the budget deficit will affect the economic growth target,” said Deependra Bahadur Kshetry, former governor. The government aims at sustaining growth at the 6.94 rate of the current fiscal year. The targeted growth rate is 7.2 percent for next fiscal year. Inflation will be kept below 7 percent.